Dwight Bush Sr. served as the U.S. 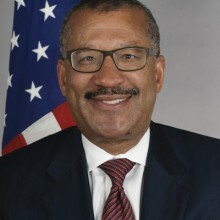 Ambassador to Morocco from 2014-2017. Born in East St. Louis, Illinois, Mr. Bush earned a B.A. from Cornell University in 1979. He then joined Chase Manhattan Bank, where he enjoyed a 15-year career that included international corporate banking assignments in Latin America, Asia, and the Middle East, and corporate finance and project finance in New York and Washington, D.C.